Bem Facil, So precisa encontrar madeiras de tamanho MEDIO, nas áreas marcadas no mapa, o acient já vai aparecer te batendo, mata ele pega o item e vai pro próximo em outro mapa. Apenas para esclarecer que a quest não começa aleatoriamente. Você precisa encontrar o Anciente Petrificado (Anciente Petrificado), ele é que dropa o item pra começar essa quest. Apenas complementando (e não sei se foi ao acaso ou não): vc não pode estar montado. To start this quest you must find one of the petrified ancients with peon corpses around it and attempt to cut it down. The lumberjack you summon will try to tell you it's a bad idea before being killed by the tree, at which point you can kill it for the quest item. I had the rank two lumbermill when I did it, don't know if this is required or not. The ancient I killed was in northern Nagrand, but I've seen them in a couple places, the easiest to find is just south across the river from the Ancestral Grounds in Nagrand. Also, when doing the shadowmoon ancient, I couldn't get the guy to spawn from logging the low level areas, and had to go to Socrether's Rise to the south. In the current beta build you need to have Lvl 3 Garrison with all small/medium/large plots filled, or else you can't use the Barkskin Tome quest item to sart this quest. The quest is still broke. Even after the update this mourning it hasn't been fixed. After today's build this quest seems to be working, and after a bit of trial and error, it seems the ancients spawn when you harvest lumber inside the giant blue search zones that the game gives you. So long story short, quit looking for spawns and just play lumberjack and you'll get all four eventually! This quest starts from Tomo da Pele de Árvore which drops from a Anciente Petrificado (visible only after you have Serraria Nível 2). It requires that you kill 4 ancients, each in a different zone. They will spawn only when you are harvesting medium-sized Timber (not Small Timber). You'll be placed immediately into combat with them, so be ready. If you run out and drop combat, they will disappear. It is possible to harvest Timber outside of the areas marked by the quest on the map, and they are usually found more frequently in areas with level 100 mobs, which I'll list as suggestions below. You can also click the mob's names and see on the map where most people have found them. "Lumber Mill: Legacy of the Ancients has increased spawn rates of Medium Timber around the Botani Marsh area in Shadowmoon Valley." Generally speaking, in Shadowmoon Valley, medium Timber is now plentiful all up and down the river from The Nightmarsh to Blademoon Bloom. I found Loruk about where the "S" is on the map in Everbloom Wilds. Its between two huts near a lvl 100 Rare spawn NPC. Can be a bit difficult to get to but if you walk up on the mountain behind the huts you can get to the medium timber. I also found Autuk near Telaar in Nagrand. There are several meduim timber out there so I should be quick. Legacy of the Ancients was my favorite computer game I used to play on my old Apple IIe years and years ago. I wonder if this quest name has anything to do with the old game. Note that the ancient will only spawn if you are still able loot timber, i.e. you must have less than 250 timber so that you can loot the timber from the medium tree. there are no medium trees in gorgrond, i just went thru all jungle locales & only small, WTF! To find the normal Timber in Gorgrond, I recommend looking north of the northern zone that the quest recommend (which is north of the Everbloom Wilds). The quest zone is not very accurate for finding the right trees. For getting Gorgrond I had to go WAY to the north of where it says to go. I found mine at coords 65, 24. For anyone wondering, it doesn't matter if you are already full on 250 timber. The mobs will still spawn when logging medium timber in the zones described. Note also that they are not a 100% chance to spawn. After quite some time searching for the Anciente Petrificado to start this quest, I found out that after some Timber gathering my Mestre das Toras da Horda started talking about the tree being scared, petrified. After that he appeared @40.6 30.0 Nagrand. Several comments mention the Everbloom Wilds in Gorgrond as the best place to farm medium Timber but getting to it may not be obvious especially if you've never been there. Fly to the Everbloom Overlook flight point on the north coast if you have it. If not, fly to the Wildwood Wash flight point on the east coast. Behind the flight point is a path leading down to the water. Get on your water walking mount and start following the coast line north. When you get to Everbloom Overlook, there's a path up from the water. Make sure you grab the flight point for future use.Travel southeast just inside the mountains which follow the coastline to the area around /way 72 39 . There are three medium Timber spawn points here. I also chopped down all the smalls in case that helped encourage respawn but who knows. Good luck! I've cut down lilke 50 Timber tree's in Nagrand and I have yet to spawn the ancient yet. Question: Are these displayed on the minimap like timber? Been a while in Socrether's Rise looking for my first Ancient. Also looking elsewhere now and then ofcourse. Since you need the Serraria, Nível 3 for the Lumber Mill - Level 3. - This will explain exactly How to get it. (keep in mind... Spawn locations flickers so not always where i said it may be). Petrified Ancient will show on Minimap @ Quest mob will still spawn at 250 lumber limit. First of all these are the criteria you need to have to countine. This is for Aprimoramento da serraria, which you need to complete. Lumber Mill upgraded to level 2 (with the quest done to harvest "timber). Completed the Quest Upgrading the Mill. Completed the Quest at (lumber mill) - Respective Alliance // Horde. Have an in-progress, 75 Work Orders - (can be at e.g 30/75 work orders). Completed all required criteria including all 75 work orders you will recive the plans by Mail or Inventory. - Note, These Ancients can be found all over Draenor! Not just one zone or location. Kuruk, o Anciente - Kuruk - Vale da Lua Negra - Socrethar's Rise @ Contains Lenho and Lenho Grande in the Area. Hanuk, o Anciente - Roots - Agulhas de Arak - Nest of Ravenspeakers (Middle of the zone). Autuk, o Anciente - Trunk - Nagrand - OSHU'GUN @ Nivek's Overlook (Southern parts). 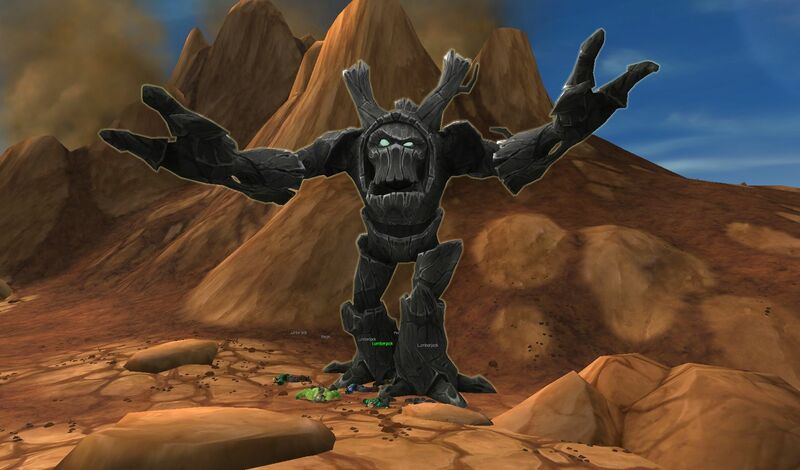 Gorgrond - Anciente Petrificado <Dead Peons> - 41.61, 37.57 - Skysea point - (100 yard up the road). Gorgrond - Anciente Petrificado <Dead Peons> - 43.65, 92.97 - Bastion Rise - (100 yard West from Flight Path) (world map). Gorgrond - Anciente Petrificado <Dead Peons> - 50.42, 42.47 - Gronn Canyon - (Close to the tiny Jungle). Gorgrond - Anciente Petrificado <Dead Peons> - 57.61, 43.15 - Everbloom Wilds - (100 yard north of Flight Path). Gorgrond - Anciente Petrificado <Dead Peons> - 62.05, 32.54 - Everbloom Wilds - West Above Water pools (rare: Venolasix). Spires of Arak - Anciente Petrificado <Dead Peons> - 52.31, 52.23 - Nest of Ravenspeakers - Aproxamitly the area. Petrified - Peons at the feet. @ - Imgur. Please if you got further locations to help me out with this post! Note: Cordinates, (assumed location), Zone - Screenshot? 2nd Spawn: Phylarch the Evergreen yells: Twice you have bested me. You will not win again! 3rd Spawn: Phylarch the Evergreen says: Your... Your species is superior. I am yours to command. By this time he will give you an quest and become your Lumbermill follower, Pilarco, o Sempre-verde - Congratulations! Edit: Added additional specific requirements and achivement-quest. Edit: Added another location. Everbloom Wilds. Edit: Added and confirmed Nagrand Oshu'gun - southern part (Nivek's Overlook). Edit: Added and confirmed Shadowmoon Valley - Socrethar's Rise. Edit: Added and confirmed Spires of Arak - Nest of Ravenspeakers. Edit: Added new Petrified Ancient locations, Nagrand & Gorgrond. Edit: Added new Petrified Ancient in Gorgrond. Edit: Added Gorgrond Petrified 2015-05-07) 05:34. Edit: Updated information 2015-05-07) 05:40. I got the spawn on the first tree every time. I could not find a medium tree in Gorgrond. I went all over the zone then finally just stuck in the 100 area. I finally found a medium tree and almost lept out of my skin. I activated the cut down process and a helicopter came in and no Loruk. After hours in the zone I didn't know what to think... the others were always the first tree. Half hour later I find the second tree. A hunter rides past me dragging half the zone, and drops them on me. Once I was dead, he got the Loruk to spawn and killed him. This quest is becoming silly. There are no medium trees in this zone ... Large and Small. I am about to quit. I had to get my Gorgrond spawn at around 62, 24 'Broken Horn Village' which is outside the marked quest area but definitely works. This is a great area for timber in general, about 10 various sized trees up when I got there. Also, all of my ancients spawned on the second medium tree I cut in the zone. Don't know if this is scripted or just insane odds. When looking for the ancient in Gorgrond, don't use the 'Flying Rocket' type ability on your Mechashredder 5000. It causes the boss to despawn! You can use the flame ability / saw blade just fine, but cannot use the flying one! Even if it does happen by mistake, rest assured, he will spawn again - took me ~ 15 attempts though after the despawn. Loruk first spawned within ~5 timber chops. There is only Timber (not smal or large) I was found in SV and yes, its out of quest-marked zone. I was wandering one hour in "quest-zone" cut every small tree but nothing, then, on first attempt at place mentioned above : voila ! Kuruk spawn and else is history. Luckily I was enough stubborn (or desperate) to try out of quest-marked zone. Hope this will help :) Good luck ! protip for the first part: the petrified anciend is displayed as a lumber node, but named "petrified ancient", so dont bother farming lumber. Find the ancients as showed here. When you get this quest it's because your lumber mill is already at level 2 or you cannot interact with the Anciente Petrificado that will drop the Tomo da Pele de Árvore you need to start this quest. So when you get your level 2 lumber mill, you're able to mark medium lumber. When you want to farm for the 4 ancients just find a spot where are medium lumber, it just say lumber when you look at the yellow dot on your circle map. Coração de Kuruk from Kuruk, o Anciente is in Vale da Lua Negra. The best spot i have found is in Socrethar's Rise, level 100 area. Pay attention to the level 101 elite demons Lordemônio Sargerei but the rest is easy. Graveto de Loruk from Loruk, o Anciente is in Gorgrond. The best spot is the north-east area level 100 of Everbloom Wilds. Raízes de Hanuk from Hanuk, o Anciente is in Agulhas de Arak. The best area is near the flight path of Talon Watch west of Sethekk Hollow. Tronco de Autuk from Autuk, o Anciente is in Nagrand. The best area is around Oshu'gun level 99. In order to get this quest you must locate a Anciente Petrificado to chop down (warning, you will have to fight him) which in turn will give you Tomo da Pele de Árvore. This quest item will then grant you this quest O legado dos ancientes which is used to get Aprimoramento da serraria along with placing 75 work orders at your lumber mill to get your level 3 blueprint plans for Serraria, Nível 3. For those having trouble in Gorgrond, I finally found a regular Timber and had the ancient spawn at 54.48, 45.59. It's just a little outside the blue quest area on the minimap, and close to the Everbloom Wilds flight path. It's in the 100-level area. Am I the only one having a problem finding the quest? I have been looking through ALL the mentioned locations, and riding around the 4 areas for like 2-3 hours now. Nowhere is a Petrified Ancient lying, with peons around it. Yes I have Lumbermill level 2, Yes i have 75 work orders done. I only need this quest, but it seems impossible to find? Any help? Or am I just being really unlucky? found the motherload of timber all around Broken Horn Village in northeast Gorgond, just northeast of Blackrock Foundry. lots of small and medium timbers, and I quickly maxxed out to 250 timber. unfortunately there is not flight path there, and it's a bit of pain dodging mobs and running up the mountain. and even though it's not in the blue quest area, I got my Twig. The area seems a bit bugged, as some of the trees are spawning inside buildings, and sometimes I clicked on a tree and the lumberjack would run to another tree, I would get the timber from that tree, and the tree I clicked on would vanish. To get this quest you need to find and kill a petrified ancient. They can be found here: Anciente Petrificado, you click him, like timber, then he will activate and you can kill him. From him you will loot a Barkskin Tome; This is what gives you the Legacy of the Ancient quest. After an hour of fruitless searching and a lot of lumber, I found heart of kuruk up in Socrethar's Rise /way shadowmoon valley 44.89, 70.10 to get there. It is a lvl100 area and a dangerous place to be a lumberjack. I found 1 medium timber in The Verdent Mire, an area next to a lake between the flight paths Embarri Village and the Path of Light. Is there supposed to be a cutscene after finishing the quest? Lumber Lord Oktron says "Now let's see what happens when we put all the pieces into place." when you finish the quest. And then... nothing happens. No scene or anything takes place. Is this a bug? Let it be said---To get this Quest you must first have a lvl 2 Lumber Mill; TWO-- find the Petrified Ancients (393K HP). I located him in Everbloom Wilds-Gorgrond. SouthEast of the Everbloom Overlook Flight path. or even easier the words "Everbloom Wilds" on the map in Gorgrond ==> to the Right of the M....in the Green patch on the map between the ^^Green grass^^ ridges on the map... Kill The Petrified Ancient and he Drops the Quest to start this whole Quest. Only Posting this because i could not Find it anywhere else... all the other Comments just say you need to collect the 4 items from each of the ancients but not how to actually start the quest. The mobs will fail to spawn if you already have 250 timber in your bags and bank. Putting them in your bank fails to change that. I feel it is important to note as I cut down like twenty trees before I figured this out. When you have <250 timber the quest mobs immediately spawn on the first medium timber that is cut. Such as has already been said. I am without any idea why someone is foolish enough to down vote elonoil saying the same thing as I just did. So instead of deleting this I will leave it here as I am unable 'reply' to his for some reason. The one saying they had them spawn with max lumber must have done it in an earlier patch; And this much be a recent update from Blizzard; Because such as I said, I cut down fifteen to twenty with max lumber and nothing spawned. The moment I got rid of ten lumber, the quest mob immediately spawned on the first timber. I did a faction change while having the O legado dos ancientes quest half-way done and now the quest has disappeared and I've been on the lookout for another Anciente Petrificado. I recommend completing the quest before faction changing because finding another has turned into a nightmare. The easiest way to spot a tree that is the correct target is to put your cursor on the tree. Normal trees will be labeled "small", "medium", or "large", but the target trees for this quest are just labeled "Timber". You don't have to waste time trying to find the right "medium" tree. i found socrethars rise as a good place as well, because there were a lot of other people euesting and killing mobs, so i didnt have to encounter anything. So, for Twig of Loruk, I thought I'd note I cut a 'Timber' just NW of the quest area marked on the map - in Evebloom Wilds, south of Blackrock Foundry in the pass that's on fire and has a damaged iron ball and a destroyed cannon. This was just OUTSIDE of the quest area shown on the map/mini-map. Cut it down and he spawned. This was between the flaming area and the Ancient Waygate Protector, closer to the ball and flames. This questline is currently bugged. Medium lumber, marked "Timber" which is the petrified trees will not spawn ancients so you will have no way to finish the questline and your lumbermill will be stuck at level two until Blizzard coders fix the problem. I'm trying to start this quest by killing the petrified ancient. I went around the map and found the petrified ancient with lumberjacks standing around. I can't click on the tree, and the lumberjacks are just normal NPCs that I also can't interact with. I have done the brothers quest that some people say is necessary, I have over 75 work orders done as shown in my achievements, and I have lumber mill level 2. My understanding is the lumberjacks are supposed to be corpses around the ancient and I'm supposed to be able to cut down the ancient, which isn't happening. Does anyone have any ideas how to actually do this? Oh, and this is the second petrified ancient I have found; and both have done the same thing to me. One key bit of information missing from all the comments here is how or who to turn this quest in. The final turn in, in the case of the alliance is at your garrison Saw Mill. There is Vinicius Toquinho waiting for the turn in. One key bit of information missing from all the comments here is how or who to turn this quest in. In the example of the alliance, the turn in is at the Lumber Mill in your garrison. There awaits Vinicius Toquinho to complete the quest. I will update this as I come across other locations of where the Ancient is to start the quest. If you deleted barkskin tome while cleaning bags you are out of luck. Gamemasters say it cannot be restored and you can not get another to drop and it even bugs your alts to where they can not get it also. So if you delete it pick another building because you can never get level 3 lumber mill after deleting tome until Blizzard fixes this or provides alternative path to upgrade sinceany characters on your account will be unable to get a barkskin tome to drop again. I can confirm that if you delete Barkskin tome Gamemasters are unable to restore the item and you have no upgrade path for level three lumber mill. This will effect all characters on your account so be very careful to not delete the tome if you wish to get level three lumber mill on your account. Who is getting paid to design and put this in the game? I started with no lumber in my bag. Spent about an hour in Gorgrond and ended up at 206 lumber - and no sign of the quest mob. Every other quest mob spawned on the first Timber I chopped. Decided after reading these comments to fly back to garrison and put a work order in. Went back to Gorgrond and sure enough the first Timber i cut netted the quest mob/item. The "quest area" is a misnomer. When in Gorgrond, the initial quest area shows as the area south of the Alliance outpost, Highpass. BUT...when I flew up to Everbloom Outlook, the "quest area" moved to all around THAT FP. So I'm guessing that the "area" for this quest is actually wherever you find a medium timber in the zone in question. For those having problems finding the needed Timber in Gorgrond, go to the area northeast of Blackrock Foundry (Broken Horn Village). If you have the robot for your outpost benefit, you don't need to go through all the mobs -- just go along the water line with your Azure Water Strider or other water-walking mount until you're at the cliffs right below the village (and you'll see TONS of timber at that point), then summon the robot mech, get right up against the cliffs, and hit the jets & fly up. You can go right to a timber area with no mobs, and there should be several Timber right there. Aruk spawns, kill the mother-lovin' woody, loot, hearth out, you're done. After many many unsuccessful Timber pick-ups at Gorgrond I went here and read the comments. Finally I was able to kill him at 70,30 in Everbloom Wilds. I took out nagrand so be sure to use this when in the zone. I made an account especially to post this comment. Sure, might seem obvious to some but I was frustrated and completely lost until I realised that the four ancients are located in different areas from the medium timber. Chop down medium timber and one of the ancients will spawn instead of the lumberjack. Find a Petrified Ancient. The easiest place to do this is in Nagrand, since it's *mostly* flat and if you turn up your view distance, you can find them fairly easily...compared to other zones, at least. After you start the quest, go find regular Timber (not small, not Large, obviously, since we can't cut that yet)...regular medium trees in Nagrand, Spires of Arak, Gorgrond, and Shadowmoon Valley. Cut Timber in this zone until you get a named ancient to spawn, kill the ancient, and loot the item, then move to the next zone. Turn in to your lumber mill in your garrison. I managed to get all but the Spires ancient on the first Timber cut, but I'm guessing that was just lucky. Really, the most irritating part was looking for the Petrified Ancient, I saw them heaps when questing and none when I needed it! I actually got my ancient to get the quest up on the big hill where the flight path to shattrath is, it was in the middle of the area, I was fishing and I just cleared it and accepted the quest. For Twig of Loruk, don't bother to farm the trees around Beastwatch. I worked that area for over 2 hours and spent most of my time just trying to FIND medium trees; almost all of the trees there are small. Instead, go to Everbloom Wilds, around Breaker's Crown. The first timber (med tree) I cut brought me the ancient with the twig. Be prepared, however, for lots of lvl 100 mobs in the area. Possibly a nod to the game called "Legacy of the Ancients" from Quest, Inc? Always had the Ancient popping on my first medium timber. Wowhead lists the quest targets for this quest as 98-100 (or 96-100 for Hanuk), but they actually spawn at your character level. So when my level 94 priest found Kuruk he was level 94, and didn't stomp me flat after all! I've done this on two toons so far. Both times, I had quite a time trying to find a Timber (not a Small Timber) in the zone of Gorgrond, today spending approximately an hour or more running up and down being chased by mobs. I finally found the tree that had Twig of Loruk today in what seems to be approximately the same place as last time. Due to the density of mobs in Everbloom Wilds, maybe you could try camping this spot for a little bit: coords 54.4, 45.5 It is off to the side, so is relatively safe. I found the Twig of Loruk between the two FP in Everbloom Wilds, at 63,35. Hope this helps! fly to Shattrath flight point. when you come across the bridge, stop and look left. you will see the tree standing there. he looks like a stone statue. he's really big. can't miss him. he seems to be there pretty much all of the time. click him and give it several seconds. (10 i think) he'll come to life. kill him and he will drop the tome to start the quest. it will have a yellow exclamation point showing that it starts a quest. (re some comments about accidentally deleting it-you would have to type delete to get rid of it). now that you have the quest, simply go to each zone and click to harvest a "timber". when you harvest the tree, the angry trees with the drop will come stomping out of nowhere at you. kill the angry tree and it will drop your quest item. as it says in other posts, the "timber" will be in primarily higher level areas. use your ingame tracker and go to the blue areas. click any "timber" and the angry tree will spawn. nothing mysterious or tricky about it. i hope this helps and saves you time. Finally found Loruk tonight. Have been trying to find a couple of weeks. Looked where I was told near flight path at Everbloom Overlook, just near a hut. Had looked there several times and other places as well and thought I would go back near flight path again. Killing and chopping so many trees I lost count. Sorry I don't have co-ordinants but near the hut just down from the flight pat is where he finally turned up. Before starting this mission, you might want to make sure that you have "Find Timber" tracking selected (for idiots like me who wanders around for an hour without finding a single timber and thinking he's just unlucky). Found a "Timber" at 57 34 that spawned Loruk and it was outside the blue recommended search zone. Good luck all. Where am I able to OBTAIN the quest? fly to Shattrath (ED: city) flight point. when you come across the bridge, stop and look left. you will see the tree standing there. he looks like a stone statue. he's really big. can't miss him. he seems to be there pretty much all of the time. After I got the quest, I flew around Talador for a good 45 mins, chopping down trees (I know, it only spawns off med Timber, but after flying by several small and large, I figured they were taking up spawn points and started chopping them down too) to no avail. Finally I got annoyed and went to Shadowmoon to try my luck, since the heart is "first" item on the list, and all the med Timber are in one easy to find spot. First Timber, guy pops. Then I went over to Arak, again.. first Timber. So, if you find yourself starting in another zone and unable to get a spawn... you might consider going down to SM. This is my completely anecdotal and likely superstitious observation, but you may have to prime the pump, so to speak, with Kuruk. And the Timber are super easy to spot and farm in one straight path. Not sure if anyone has mentioned this but when you do find a petrified ancient, make sure you aren't grouped or the quest will not drop. obtained Heart of Kuruk in The Nightmarsh in SMV. .. If you have the stables building in your garrison and cut trees without even landing, the quest mob will not spawn. You have to be on the ground for them to spawn. Players with stables - not only do you have to be on the ground, but you have to be OFF of your mount. I was on the ground but still on my mount, and my peon died right in front of me, with no dialogue or spawn. To Be Honest, I just ran this with the current live version. Followed everyone's specified coords and got unlocky in each zone. The coords have been placed on the maps now. Just follow them for each item, by clicking them above and chop "Timber" and that will have a chance to spawn it. My rate is 1/3 for the ancient to spawn. It takes like 5 minutes to go through a group of "Timber" for the Ancients to spawn in within each zone. Also have a coord tracker or some sort of addon to the UI to help you track your location and follow the specified coords on the maps provided from WoWHead. Happy Hunting! It took me 3 nagrand timbers, 3 gorgrond timbers, 1 shadowmoon timber and 1 arak timber to finish the questline. Took me so much especially to find the quest starter. All very interesting, but WHO AND WHERE IS THE QUEST GIVER? and RIGHT after I wrote my last comment about luck in Gorgrond, I was tabbed out of game, got back in, had flown to Crow's Crook FP. saw a TIMBER and it spawned Hanuk. Follow the arrow to get into the zone it shows, click your saw blade on timber (I found small timber didn't work as reliably as medium timber.) You will harassed by an ancient who will drop what you need when killed. Go on to the next designated on your map repeat. When you have all 4 pieces return to your garrison and complete the quest. I did not fuss about being in a particular spot. It doesn't seem to matter. Just be inside the designated zone. This is one of the worst quest-chains in the game, by far. You begin by attempting to find a rare mob that can be anywhere on the continent. Then, you have to farm lumber until you get a random spawn. But the spawns only come from medium lumber, which will often completely fail to spawn for the Loruk phase. And when it does, good luck beating the crowd to it - the cross-realm zone garbage really makes this frustrating. Honestly, Blizzard really needs to implement some sanity checks on their quests. Either this didn't get tested, wasn't properly thought out, or is buggy (quite possible, since the lumber phasing is known to have issues). Whatever the case, crap like this makes people quit the game. since it hasn't been said yet: mobs will not spawn while mounted. Be prepared to spend hours on this quest at the mercy of RNG. No one (as far as I saw) mentioned that you actually need to complete rest two achievements in the "Upgrading the Mill" - both "75 Work Orders" and "Reduction in Force" - before you attend this one (or I was super unlucky). I spent like 3hours flying in Gorgrond, all the regions of Everbloom Forest, with no luck finding Petrified Ancient. I had like 60 Work Orders issued at that time, so I decided to make it 75. In the meantime I was searching for the possible reasons in my failures. Couldnt find anything related to that part of the achievement (75 work orders), which came a bit odd, since the mission "Reduction in Force" I did minutes from I found the Lumber Quest Giver trapped beneath the log in Shadowmoon Valley. However, I gave it a shot at 75 work orders (you dont need to wait for them to finish), went to Gorgrond, Everbloom Forest, Everbloom Wilds taxi. I flew north, and found Petrified Ancient just north of Everbloom Overlook taxi. Once I got the item questgiver, I went by the northern coastline. Since I got no mods, Im unable to provide coords, but Imma try. Right from the Blackrock Foundry you got 2 "house" icons. A bit right from the rightmost house I cut the Lumber (medium lumber) and I got the Gorgrond ancient. Colete o Coração de Kuruk, o Tronco de Autuk, o Graveto de Loruk e as Raízes de Hanuk. Ao abrir o tomo antigo, você percebe que, na verdade, trata-se de uma caixa. Dentro, há quatro divisórias vazias. Examinando de perto, você vê que cada divisória exibe um anciente draenoriano entalhado, alguns glifos e um receptáculo usado para guardar um pedaço do anciente retratado. Além disso, há indicações do paradeiro de cada um deles: árvores de porte médio em Lua Negra, Gorgrond, Agulhas de Arak e Nagrand. São ordens de assassinato. Árvores querendo matar árvores. O que você trouxe, comandante? Você está me dizendo que este livro, na verdade, é uma caixa que contém os restos mortais dos alvos de uma lista negra? E que os assassinatos foram perpetrados por outra... árvore? Vejamos o que acontece se colocarmos os restos no lugar indicado.